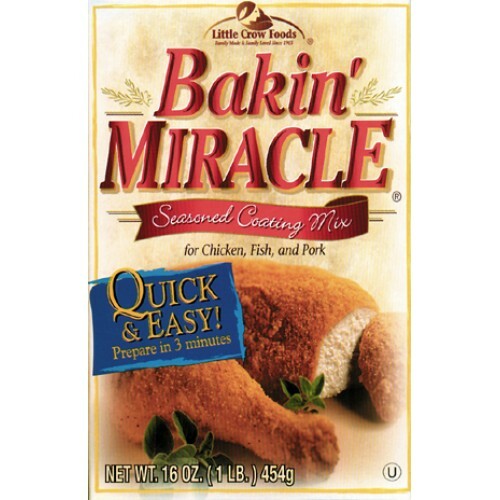 Whatever you coat, however you bake, Bakin' Miracle's new and improved special blend of herbs, spices, and flours creates a better-than-ever delicious coating for chicken, fish, pork, and vegetables. Bakin' Miracle is formulated especially for the microwave or conventional oven. And it's a great value! Bakin' Miracle makes whatever you cook tastier, moister, and more tender. Bake chicken, pork chops, fish, potatoes, chicken nuggets, zucchini, onion rings, etc., etc. And you can use your microwave or conventional oven. You choose! A hard-working product (so you don't have to), Bakin' Miracle goes a lonnnnnnng way. Microwaveable. Coats about 50 pieces of chicken, pork, or fish. Fryin' Magic Seasoned Coating Mix (six 5-lb. packages) The secret's in the taste. The magic's in..